Hi! 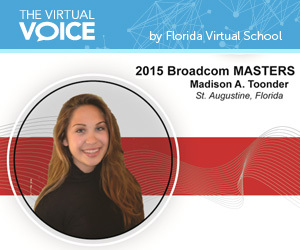 I’m Madison, a student at FLVS. While attending a Busch Gardens camp in the summer of 2014, I learned that the park utilizes oysters to naturally filter their lakes. I soon became fascinated with oysters, and after some research, I discovered oysters are dying globally due to pollution. After this discovery, I formulated an experiment focusing on the effect of micronized chemical sunscreen (as used in spray sunscreen) and nanosized zinc oxide sunblock (as found in thicker, clear sunblock) on the ability of a bivalve mollusk (or oyster) to filter bay water. It was originally hypothesized that increasing public awareness of the importance of protection from UVA and UVB rays and the consumer’s demand for lighter, less oily, and clear sun-protection is rising. As a result, manufacturers are nanosizing sun-protection ingredients to meet these demands. Microscopic residue is being introduced into the environment, potentially harming humans and marine life. Chemical sunscreens contain multiple chemicals, including known carcinogens, and physical sunblocks contain nanoparticle versions of Titanium Dioxide and Zinc Oxide. It was hypothesized that the oysters introduced to zinc oxide nanoparticles would experience a decrease in filtering ability. Researchers theorize that some types of nanoparticles may build up in the bivalve mollusk’s system over time and linger in their system up to three days longer than any other nutritive material. Based on studies on the effect of chemical sunscreen on humans, it was also hypothesized that the micronized chemical sunscreen would affect the oysters negatively and rapidly. Due to the oyster’s small size, the chemical sunscreen could also take their lives. As predicted, the introduction of zinc oxide nanoparticles caused a gradual decline in filtration abilities of the bivalve mollusks in tank one. The nanoparticles of zinc oxide built up in the body as it was filtered in with nutritive matter consumed by the bivalve mollusk. While the nutritive matter, like algae and phytoplankton, was digested and excreted, it left the nanoparticles of zinc oxide to remain in the system longer than the food. The oysters introduced to the micronized chemical sunscreen experienced an extreme decrease in filtration ability and died after only five days! This can be attributed to the chemicals and carcinogens entering the oyster’s body and affecting them on a cellular level. As mentioned before, the microscopic size of the particles allow them to easily enter the body and cause internal damage. 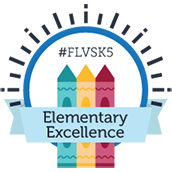 As a homeschool student with FLVS, my research earned me top prizes in my regional and state science fairs. My top prizes allowed me the opportunity to apply to the Broadcom MASTERS national science fair competition. I was humbled when I was selected as one of the top 30 in the nation to attend the Broadcom MASTERS competition in Silicon Valley, California from October 2 – 7, 2015. I had the incredible experience of working alongside 29 of my peers from across the United States in STEM challenges on a marine research vessel; touring Google, Tesla, and NASA; and meeting Scott McGregor, CEO of Broadcom and Eben Upton, developer of the Raspberry Pi. The awards ceremony was attended by leaders and innovators in STEM. I was awarded the 2nd Place STEM Math Award for my research and I am extremely honored! My award was based on my oyster research project and data, leadership abilities in STEM challenges, presentation/communication skills, collaboration success, and expertise in my field (I was the marine biology expert in my challenge team). For earning a place in the 2015 Broadcom Masters, I was awarded an iPad Air, a Raspberry Pi, a Wiced, $500 cash, $2,500 towards a STEM science pre-collegiate summer camp, and $1,000 to donate to the STEM program of my choice. I am looking at attending a veterinarian summer camp at Tufts University in August. 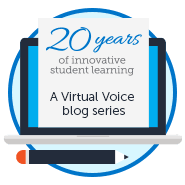 Being a homeschool student at FLVS allowed me the flexibility to conduct my research for hours each day for several weeks. This past year has been an incredible experience. I would encourage other FLVS students to participate in their local, regional, and state science fairs with the possibility of applying to participate in the Broadcom MASTERS national science competition. Since this post was published, Madison has had the opportunity to work with lawmakers to discuss legislation to address environmental concerns related to sunscreen. Read more from a Jacksonville news station here: Teen ‘lawmaker’ takes on Tallahassee. This entry was posted in Homeschool Edition, Parent Edition, Student Edition and tagged Broadcom Masters, FLVS Virtual Science Fair, Goals, Homeschool, Marine Biology, Oysters, Science, Student Achievements, Student Activities, Student Experience, Student Research, Student Success, Student Voice on October 28, 2015 by Guest Blogger. Madison, this is truly amazing! I am so encouraged and inspired by your work. It’s refreshing to see passionate young girls excited about science. Thank you for sharing your research and your work!! You will truly inspire so many other young girls and I’m so grateful for that!! Hi Amanda! Thank you very much for your supportive words. It is an honor that you feel encouraged by my work. I am extremely passionate about this research and am grateful for your support. 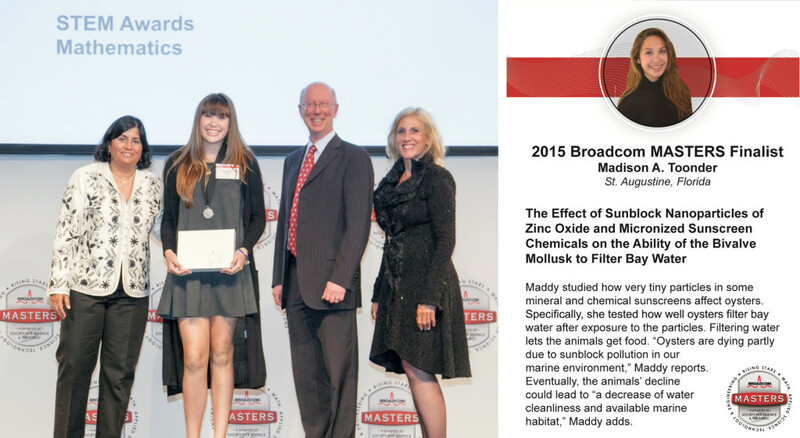 As an flvs instructor and mother of an 8 year old who loves science, I am proud of you Madison! Hello Lisa! I am honored by your kind words of encouragement. I believe in the power of the next generation inspired by science. Good luck to your child in furthering the bounds of science in the future! For me, my early love of STEM blossomed into what I am doing today!! Madison, are there any specific sunscreen or sunblock products you recommend – or a minimum particle size that is less harmful to oysters and potentially other marine life? Do you still recommend using physical sunblocks with zinc oxide instead of those with chemical ingredients? I have read that the chemical sunblocks are harmful to reefs as well, so I would be interested to hear your recommendations! Hi there Marissa! Great questions. I would recommend non-nanosized, uncoated, Zinc Oxide natural alternative sunblock between SPF 15 and 50. Basically, the best sunblock for you and the environment is the creamy, white sunblock because the particles are large enough for the oyster to reject and big enough to stay on the surface of your skin without sinking into your body. It would be best to avoid the upper levels of sunscreen as well, because they contain disproportionately increasing chemicals and don’t offer much more actual protection. More specifically, I would recommend Scratch Mommy sun protection. It is homemade, natural sunblock, that is safer for the environment. Contrastingly, micronized chemical (spray) sunscreen is lightweight and contains small particles; it easily sinks beneath the dermal layers and into our blood stream. Oysters are impacted in a similar way because it invades their filtration system and affects them on a cellular level! Research by the US Centers for Disease Control & Prevention conducted an experiment on a national scale and found hazardous chemical compounds from sunscreen to be present in 96.8% of American urine output just 5 days after spraying sunscreen on themselves (IPCS Peer Review Committee “International Chemical Safety Cards”). In summary, the non-nanosized Zinc Oxide sunblock from Scratch Mommy (http://www.scratchmommy.com/diy-sunscreen-easy-make-need-recipe/) is the sunblock I would recommend for you.